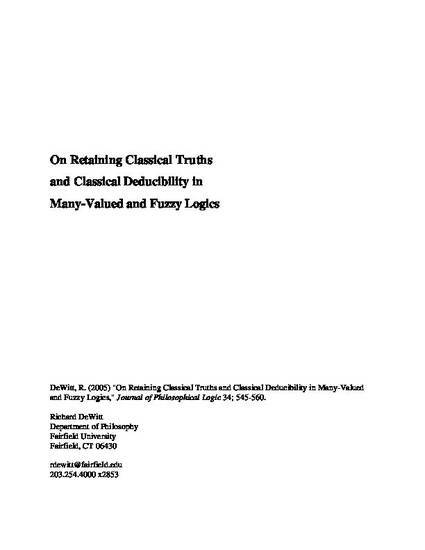 In this paper, I identify the source of the differences between classical logic and many-valued logics (including fuzzy logics) with respect to the set of valid formulas and the set of inferences sanctioned. In the course of doing so, we find the conditions that are individually necessary and jointly sufficient for any many-valued semantics (again including fuzzy logics) to validate exactly the classically valid formulas, while sanctioning exactly the same set of inferences as classical logic. This in turn shows, contrary to what has sometimes been claimed, that at least one class of infinite-valued semantics is axiomatizable. DeWitt, Richard. 2005. On retaining classical truths and classical deducibility in many-valued and fuzzy logics. Journal of Philosophical Logic 34 (5-6), 545-560.